I happened to be checking out nests on the golf course when I recognized the wobbly stance of an albatross who had just returned to land for the first time since fledging. It was A402, a 3-year old walking not too far from the area where he had spent his months as a chick. Unfortunately, a dark cloud had moved over us and the rain meant the camcorder would have to remain in its camera bag. People who live in Kauai are accustomed to sudden downpours pounding out of a sky that seemed to be clear about ten minutes previously. They may last just a few minutes, but they are intense. When the rain stopped I started to film, staying out of his line of sight. The worst thing an observer can do is to change the behavior of the animal being observed. When a photo of an albatross shows a bird staring straight into the camera, the photographer has changed from an observer to an intruder. There were several adult albatrosses hanging out in the area where A402’s sibling was sitting in his nest. My back was to them, but I could hear the bill clacks, the occasional attempt at interesting someone in a display, the sounds of socializing. The adults are drawn to the chicks, their nests are gathering places for the birds who have been here before, along with some that were banded in other areas. The birds that return for their first time back to Princeville usually land first on the golf course, wherever their nests were located. It must seem a lot less intimidating to them to come down on a large, empty patch of grass; one does not need fancy navigating skills to land on a gigantic lawn. A402 stayed a very short time. He did not seem to notice the gathering of the other adults. Very often I see a bird just one or two times when he first comes back to Princeville. Even checking every day I miss seeing most of them on their first day back. Are they just checking to see that they know where to go and can handle walking on land? Sometimes when a bird like A402 returns for the second year since fledging, he comes back to the place where he landed the first year, not to his original home. This year, of the 45 nests that we started out with, there were 22 birds that had fledged from Princeville. Twelve of those nested in the area where they lived as chicks. Of the other ten, nine who were chicks in residential areas nested next to the golf course. 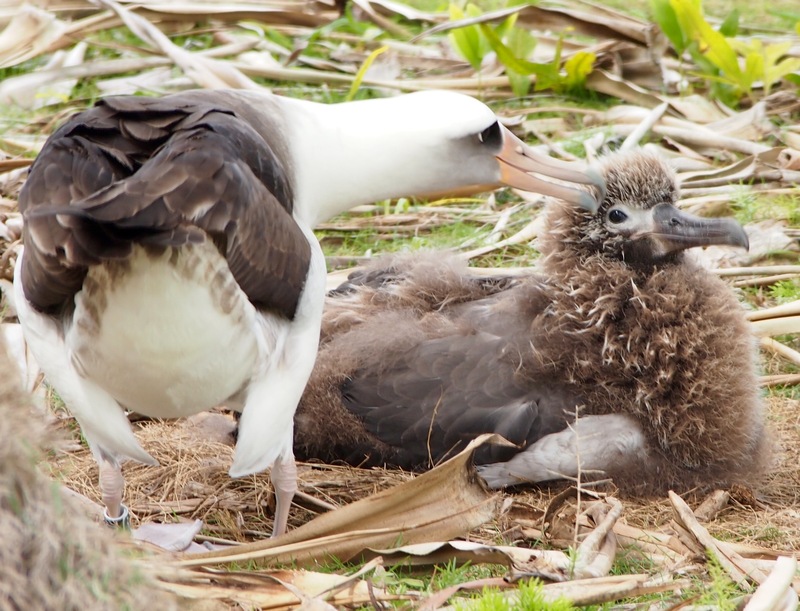 As more and more albatrosses who fledged from here come back, find a mate and nest in Princeville, we’ll be able to see what percentage nest where they were chicks and what percentage relocate to another part of Princeville. A402 came back a couple of weeks later and walked right up to his sibling, pausing to reach out to tap him with his bill. The part of this human being that loves simple, happy endings wished that the chick would have let the other bird get close, showing that he was relaxed in his presence and perhaps recognized him as a sibling. Instead, he clacked at A402 just as he had let a group of birds before him know that he was displeased by the attention. We will never know everything about these birds. The fabric of their lives is patterned by instinct, but it is richly embroidered with the behavioral differences that make each albatross unique. Where does the fabric end and the embroidery begin? We may never know. You add so much to our understanding of the albatross recognizing their intelligence and uniqueness and ultimately their connection to us. Thanks so much. Recognizing their intelligence and uniqueness and ultimately their connection to us. Looking forward to seeing you again. Thanks for the kind words, Prue. As someone who spent many years observing chimpanzees, I never thought that birds could be just as interesting!